Note: I’ve added in the Monthly Letter to the post, but I have not updated the post itself. That will come in time. 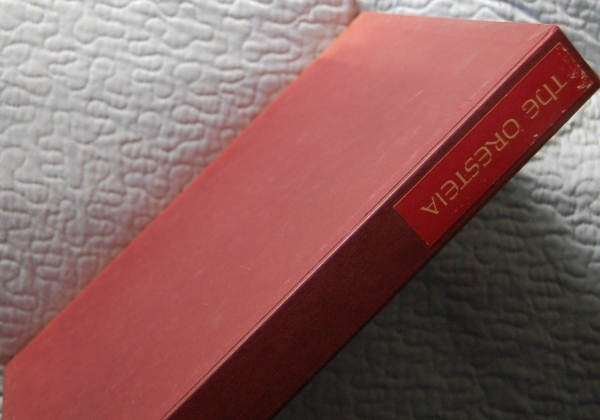 Front Binding – This was designed by Adrian Wilson, and was bound by LEC mainstays the Russell-Rutter Company in a quarter crimson cowhide and a brown natural finish cloth for the spine label and sides. Thanks to kdweber for this info! 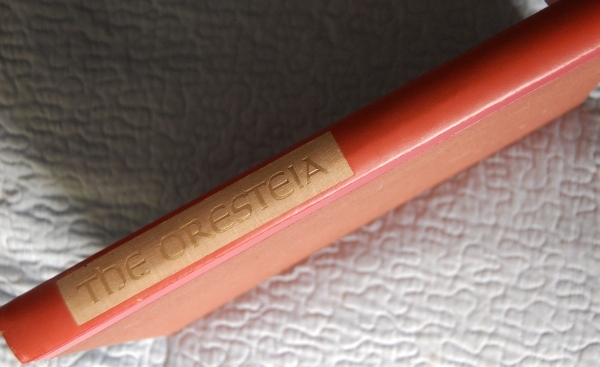 Spine – Mine’s a little faded. 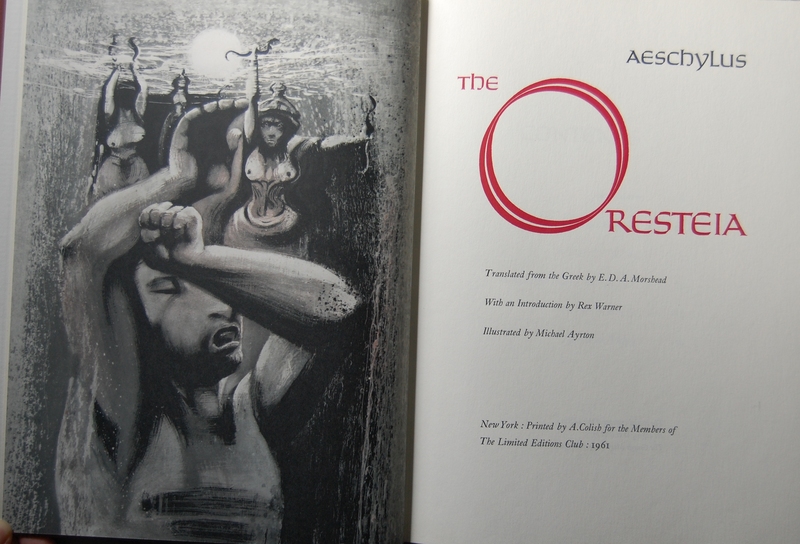 Title Page – The Oresteia features the interesting illustrations of painter Michael Ayrton, who would also do a set of Euripedes’ plays for the Club. He has a very unique style that works well for the plays. 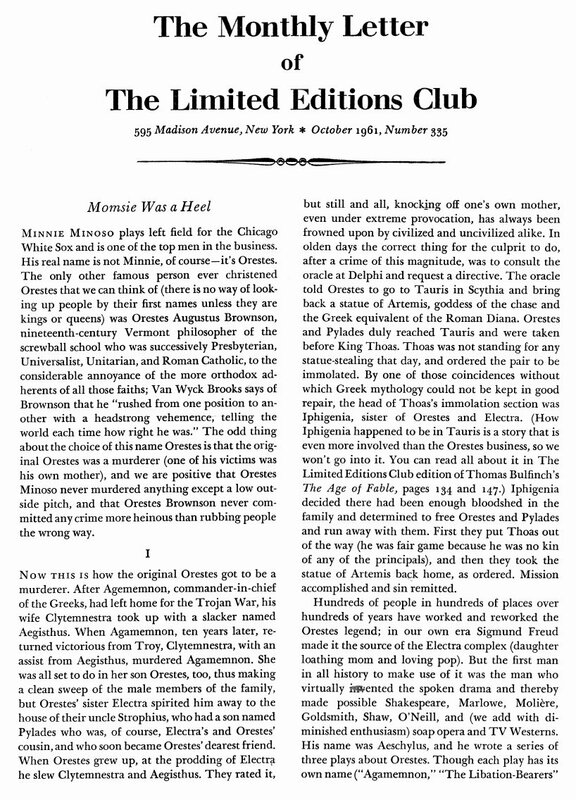 The text is set in a special LEC font called Janson and American Uncial. 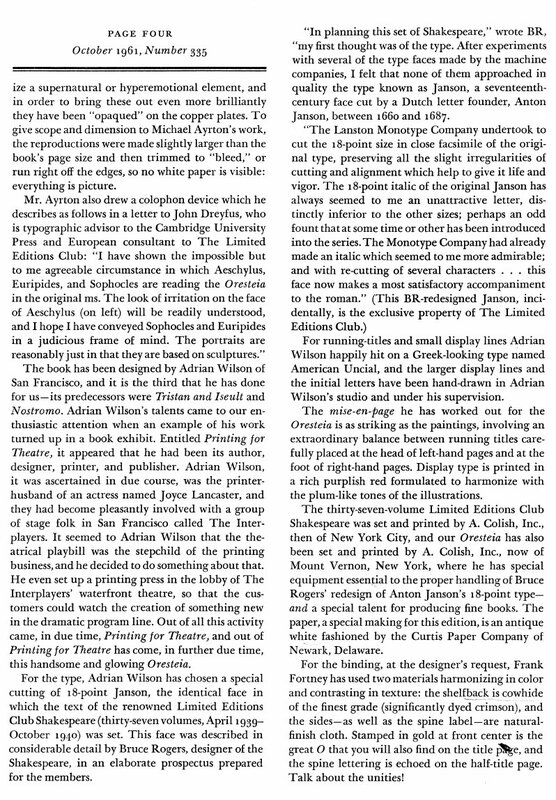 The paper was Curtis antique, and the text was printed by A. Colish in Mt. 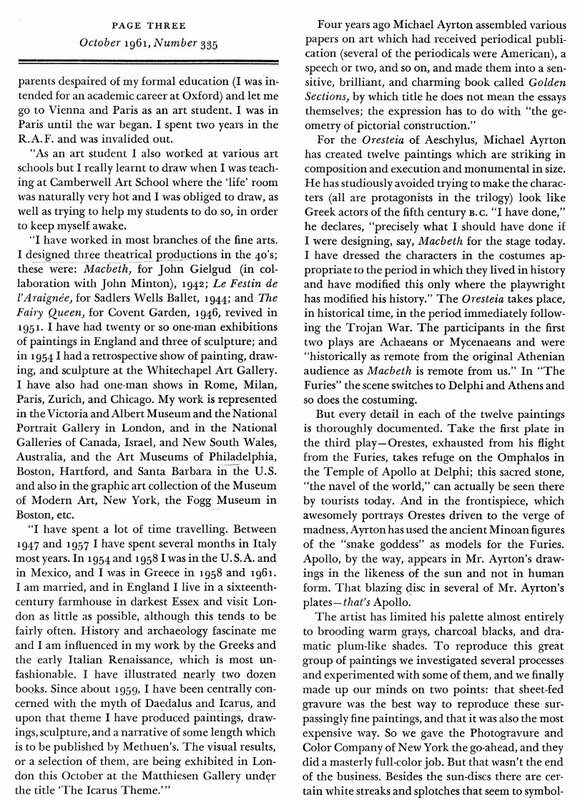 Vernon, while Ayrton’s paintings were reproduced at the Photogravure and Color Company in New York. The book was translated by E.D.A. Morshead and introduced by Rex Warner. Again, thanks to kdweber for the info! Signature Page – Here’s my copy’s signature page, which is #403. Ayrton provides his John Hancock, which is a rather nice one. 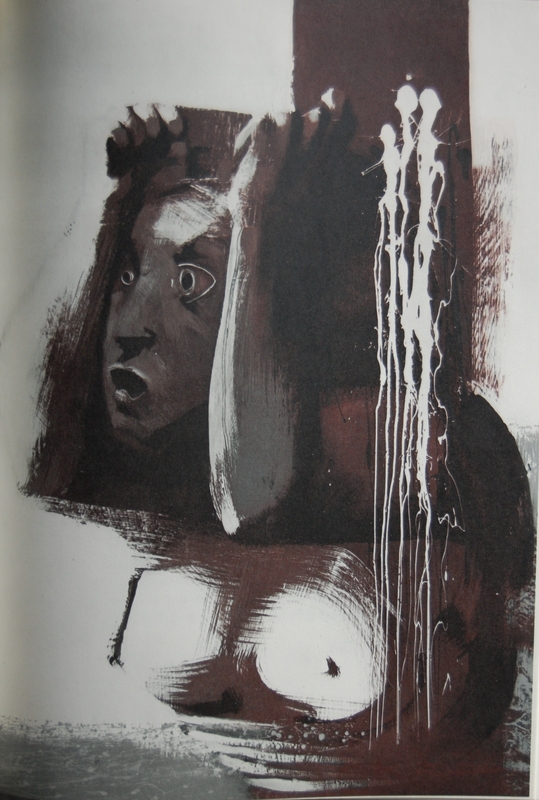 Page 53 – This is such a great capturing of terror. 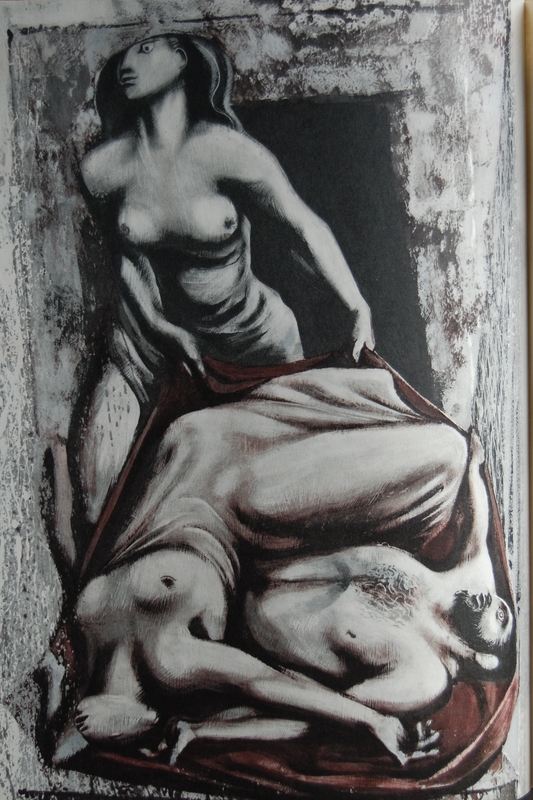 My favorite piece in the book. Personal Notes – This was my third LEC, purchased at the same store in Monterey where I got my Man and Superman and House of the Dead, as well as many of my Heritage volumes. It’s a great book, but the translation takes the dry route, which bored me upon my attempt to read it. At least I enjoy Ayrton’s art! 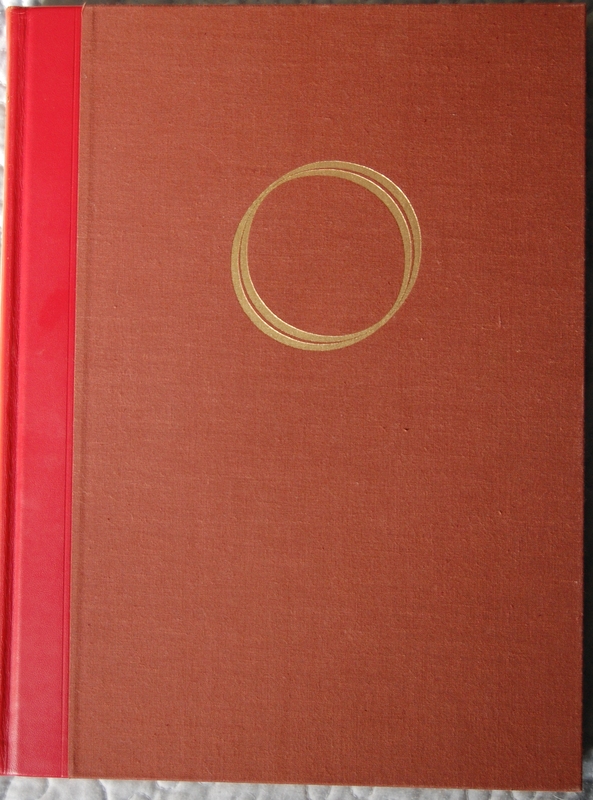 I’m looking for comparisons to the Heritage reprint or any other insights, so if you have that info, please let me know through the comments here or at my thread about this blog at the George Macy Devotees @ LibraryThing! Thanks! 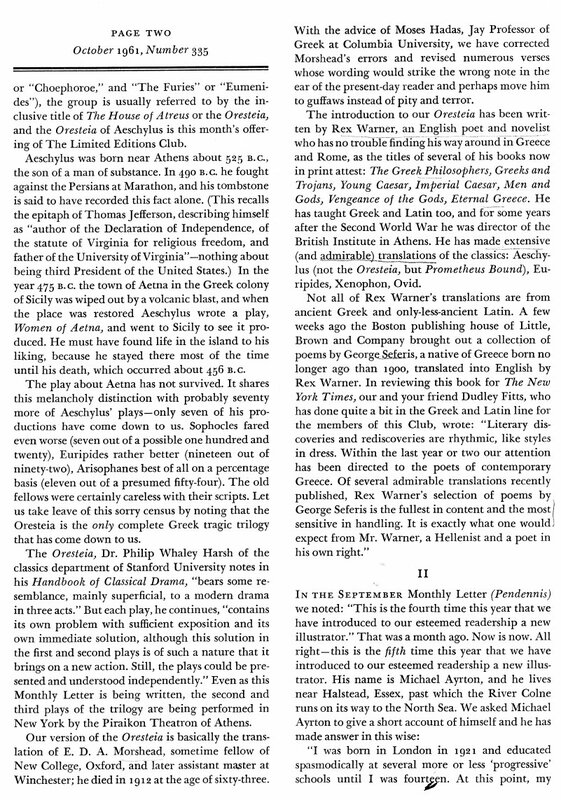 You are currently reading Limited Editions Club: The Oresteia by Aeschylus (1961) at The George Macy Imagery.